Do you have any favourite ways of using turmeric? I finally got to post about the two old cookbooks I picked up for a song in Topsham the other day. Do I need them? Absolutely not - the shelves are already bulging with cookbooks but for less than the price of two glossy magazines, how could I resist? The diagrammatic treatment of the families of French sauces and how they relate to each other are particularly good. I love the sound of the improbably named Sauce Mohammed - a variation on tartare sauce flavoured with chopped eggs, anchovies, capers, celery, cucumber and chopped onion. There's a useful chart on Measuring Heat and Bulk which tells you what temperature milk boils at (196°, less than salt water at 224°) and that butter burns at much lower temerature (278°) than beef suet (356°) Heston Blumenthal would approve. The writing is also wonderfully lucid. "The most difficult thing to explain in a cookery book is the amount of moisture that should be added to flour mixtures" Deighton writes. "Batter mixtures are like cream; they can be poured. A cake mixture is wet and will almost pour; it will drop from a spoon. Yeast mixtures are moist and plastic like modelling clay" Perfectly put. Who needs photographs, or even videos? 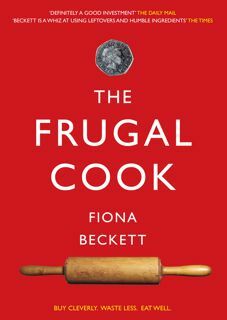 There are forgotten, frugal recipes for making brawn or stuffing a cabbage, all of which would take hours. Even bombes which Deighton says "date from the time when men in long beards with 'ski' at the end of their names hid these gadgets, still, smoking, beneath ankle-length cloaks." As you can see, a great book to dip into. By comparison Green Cuisine: the Organic Vegetable Cookbook, self-published 10 years ago in my home town of Bristol is a much more modest affair though again I was seduced by the illustrations (above) Unlike Deighton's book I don't think it will become a regular kitchen companion though their are some nice ideas for cooking different vegetables such as Spicy Green Beans, Parsnip and Potato Dauphinoise and Pea and Cucumber Soup and for kohlrabi, a vegetable I admit I've never got to grips with) And at £1 who could resist? Do you share my weakness for old cookbooks? If so which are your favourites and have you picked up any good bargains lately? So what did you cook when you were a student? 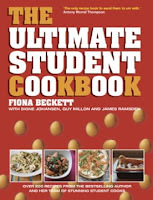 My publisher Absolute Press released details of our new student book yesterday which is called The Ultimate Student Cookbook. It's a big claim but we make it because it combines my 6 years experience of writing for students in the Beyond Baked Beans books and website with that of three current students who have been contributing videos, recipes and tips to our Facebook page this year. There were also some really weird ones - to me at any rate such as sophiemostly's husband's preference for sweet and sour sausages, Kavey Eats' Sausage Curry and Kerri of Dinner_Diary's tinned Oxtail Soup together with Matt of Absolute's odd weakness for boiled rice and salad cream (ugh). The most appealing-sounding one came from an old friend Deb, an eternal student who has gone back to uni at the age of . . . no I won't let on. "Thinly sliced potatoes layered with onions and lashings cheese sauce. Baked. Chuck in mushrooms, bacon etc if feeling flush"
So what was your favourite dish when you were a student or just starting to cook. Fabulous or otherwise. I've been editing a new bumper edition of my Beyond Baked Beans student cookbooks recently (of which more later) and once again wondered where to place risotto. Is it an everyday recipe or a special occasion one? What makes most people treat it as special occasion eating is that it needs pretty much full-on attention. Not that that's problematic - all you need is a glass of wine and someone else to chat to while you're making it but it creates the impression it's difficult. It truly isn't - the two things you need to remember are to cook the rice sufficiently (2-3 minutes) before you add any liquid and make sure the liquid you add is hot. People also think it's expensive and it's true that risotto rice does cost more than ordinary long grain but not much more than basmatti these days. And if you use ingredients in season, as I've done here, it's not an expensive supper. This is a version of a recipe I created for Beyond Baked Beans Green (the veggie title in the series) which was originally dairy free. The other evening I made it for three of us with some fresh, young goats cheese but still no parmesan or butter. (The herbs do the job of the former.) It's lighter than a conventional risotto but perfect for showing off the new seasons' spring veg. Break the tips off the asparagus spears about one third of the way down the stalk and set aside. Cut off any woody bits at the lower end of the stalk and chop the rest into small pieces. Heat 3 tbsp of the olive oil in a medium-sized saucepan or sauté pan and add the chopped onion. Stir and cook over a moderate heat for about 3 minutes then tip in the rice and stir. Let it cook for about 2 minutes without colouring, stirring occasionally so it doesn’t catch on the pan. Meanwhile heat the stock in another saucepan till it’s almost boiling and leave on a low heat. Pour the wine into the rice - it will sizzle and evaporate almost immediately. Add the chopped asparagus stalks and fennel, if using then start to add the stock bit by bit, about half a mugful at a time, stirring the risotto in between and cooking it until the liquid has almost been absorbed. Then add the next lot of stock and repeat until all the stock is used up and the rice is creamy but still has a little ‘bite’ to it (i.e. you don’t want it soft and mushy). This will take about 20 minutes. While you’re stirring away lightly cook the broad beans, peas and asparagus tips for about 3 minutes in the hot stock then scoop them out and set them aside on a plate or a saucer. Add the broad beans* and peas to the risotto a few minutes before adding the last of the liquid. Once the risotto is cooked stir in the goats' cheese and let it melt then stir in the herbs and season with salt, pepper and a good squeeze of lemon juice (about 2-3 tsp). Gently reheat the asparagus tips in the remaining oil. Serve the risotto in small bowls with one or two asparagus tips on top. I was going to blog about the two fabulous old cookbooks I picked up for a song in Devon last week but this week has been so manic I'll have to content myself with whingeing - once again - about supermarket pricing which almost matches MPs expenses claims for its deviousness. My husband who was cooking supper last night doesn't really believe in veg so I nipped down the road to get some from Tesco (Yes, groan) We were having grilled mackerel and I fancied broccoli and it was on special offer so that seemed the perfect solution. Except for the fact that even with 20p off it cost 79p. I know this is absolutely par for the course but occasionally you stop and think that that is a ridiculous amount of money to pay for a small head of broccoli for two (particularly if you paid the full price). Since when did it cost nearly a £1 to produce and transport a non-organic, mass-produced vegetable? (Not that I'm sure the grower got anything like that). No wonder we're unhealthy in this country when basic veg cost as much as this. It certainly explains why Tesco continues to earn billions a year and is thinking of setting up its own bank. It's certainly got plenty of money to lend. Anyway my new quick trick with veg like broccoli is to part stir-fry, part-steam them in a frying pan. I sweated off a sliced leek for a few seconds, added the broccoli florets (the stalks will go into a soup), stir fried a couple of minutes with a little fresh garlic then added half a glass or so of water and stirred and tossed until the broccoli was tender (about another 2 minutes), adding a slosh of light soy sauce at the end. I also added a tiny handful of living salad leaves from the plants I bought a couple of weeks back. Unorthodox but there were too few to make a salad and the effect was rather nice, like adding a scattering of herbs. One pot is looking rather sickly though. I've either watered it too much or too little . . . Any thoughts? Like many bloggers and food writers I went to the debate at the Real Food Festival on the Future of Food and have to say it was a bit of a wasted opportunity. With one exception (the corporate affairs director of ASDA, Paul Kelly) the speakers - Patrick Holden of the Soil Association, Raymond Blanc, Mark Barthel, director of the Love Food Hate Waste campaign and environmental campaigner Zac Goldsmith - were all of fundamentally the same view: that the way forward must be organic and sustainable. Speaker after speaker outlined the apocalyptic future facing us. No-one really provided any solutions.There was a bit of ritual supermarket bashing but no-one seemed to me to get to the meat of the subject which is how to feed a growing population with dwindling resources. I would have liked to have seen a more structured debate between two opposing views - Holden or Goldsmith, say, interviewing Kelly of ASDA then turning the tables half way through or two speakers actually offering a tentative strategy for tackling the crisis. (It was ill-judged not to have at least one woman on the platform, who, Goldsmith apart, were all white, middle-aged, middle class males. Or an academic who worked in the field of food policy. My heart is with the 'real food' campaigners but my experience of trying to buy 'real food' is that it's often way too expensive for families on a budget. People end up in supermarkets because it's easy and affordable. They could go to cheaper outlets like street markets but many don't know how to cook. If the Government really wants a healthier nation it needs to have a much more coherent agricultural policy and regulate the food and advertising industry much more effectively than it currently does. The supermarkets could do far, far more than they do now to get over a healthy eating message. (Look at those full page ads and spreads for their special offers in the tabloids - almost all for unhealthy processed foods). Like it or not - and I suspect many of the people in the hall yesterday wouldn't - the problem will have to be solved by big institutions rather than small ones and until they change things won't start to improve. What do you think? Do you think the problem can be solved from the grassroots up or by national or international institutions? And what needs to happen for things to change? Even though I've decided that veg boxes are not for me every so often I feel I have to give them another try. So many people (including my daughter) swear by them that I feel I'm simply not trying quite hard enough. This time I ordered a box from a local Bristol supplier Wrington Greens whose produce Ive bought and liked from the farmers' market. Only I rarely manage to get there in time to get the salad greens which is what they do best. I ordered the so-called 'super-healthy' option which meant extra greens and fewer roots - appealing at this time of year. There were baby spinach leaves, mixed leaves (above) and some hot, spicy mustard leaves plus some watercress and mint (superfluous since I've just planted my own) red onions, beetroot, leeks, mushrooms and mixed sprouts. We've had an unexpectedly busy week - always the way - so I've again struggled to finish it up. I had to chuck half the beansprouts today because they were looking a bit manky (the first half I used in a stir fry of red onions, mushrooms and spinach, an oddly successful combination I posted on my student site beyondbakedbeans.com. We had three salads, one with roast beets and feta, a leek and watercress soup, plenty of fresh mint tea and an odd but tasty rice dish made with leeks, asparagus stalks (not included in the box but picked up at the farmers' market yesterday) and a couple of courgettes I found lurking in the fridge. We've also been scrumping some sweet juicy apples. There's now just a leek and a few onions left. I have to say it was a lot better than the boxes I've had before - to have so many really fresh leaves was a real treat - but I still encountered the same old problem that I didn't get exactly the produce I fancy at this time of year. No asparagus. No rhubarb. And you do have to work hard to ensure you use the contents up, turning your back on other ingredients that are cheap and which you might have fancied buying. On the credit side I'm sure we've eaten more healthily than we would have otherwise done so I'm going to give it another go, probably in two to three weeks' time. I'll crack it eventually! The one upside of the credit crunch is that there are some amazing lunchtime bargains around currently. I've just had a two course lunch for a fiver at a Bristol fish restaurant called Fishers which was predictably packed. The first course (above) was a simple but clever salad of mixed leaves and fresh anchovies with a pesto dressing. The second a salmon fishcake with a lemon butter sauce (half eaten before I remembered to take a pic, below). Neither portion was huge but then you don't want a vast lunch if you need to work in the afternoon. I'd say the accompanying 175ml glass of Muscadet while perfectly decent was overpriced at £4.90 but there were cheaper wines by the glass. And they have to make their money somehow. It used to be the case that we all envied the French their fantastically cheap prix fixe menus but I can't think of anywhere in France where you could get a 2 course meal for 5.56 euros (today's exchange rate). Have you come across any great lunch - or dinner - bargains lately?